Okay. Pretty much anything Chronicle Books does is gorgeous, funny, smart or a combination thereof. I've been addicted to their design book series since I was in college and their cookbooks for even longer. Their journals and ephemera are always go-to gift items. 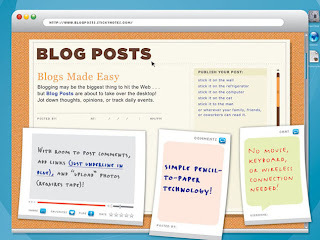 But now, they've gone and made something pertinent, hilarious and utterly useful: Blog Post Sticky Notes. p.s. first 25 bloggers to trackback to this post on the Chronicle Blog wins a set of these virtually virtual notepads! Ahh.. how cool is that? Thanks Naomi! I am all over this web tonight but I SHOULD be blogging. There's no excuse not too now!